That look like hockey to you? 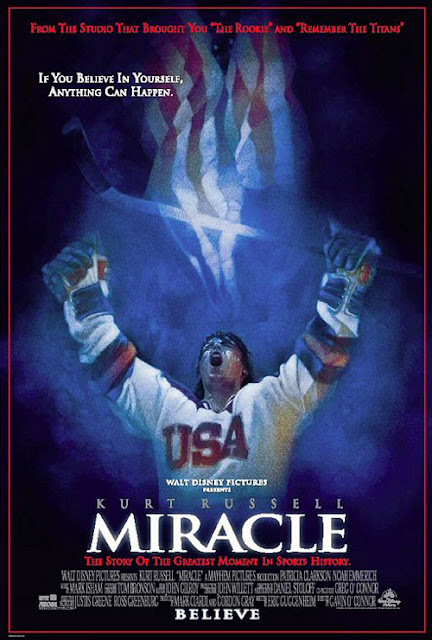 Kurt Russell coaches the 1980 US ice hockey team to victory in an all-true story! For the most part this is remarkably restrained, particularly given the kitchen sink approach taken to emotional battlegrounds by director Gavin O’Connor in his later sports slugfest Warrior. In fact, the team itself is very sparsely characterized, distinguishing between them not helped by their physical similarities. A lot of time is spent on the build up to the Olympic clash with the indomitable Russkies, and pains are taken to etch out the period trappings (gaze in wonder upon Kurt’s suits!). While this is, in itself, admirable, there’s a shortage of real smarts in the script department, as if the awareness of how “worthy” the subject matter is makes an excuse to settle for a linear triumph-over-adversity yarn. The unusual approach to making a champion team brought to mind the more recent Moneyball, which was all-round more satisfying. The real triumph here is Russell, imbuing a single-minded and not necessarily wholly likable individual with conviction and unshowy passion. He’s Kurt Russell, of course, so that’s a given. Worth noting are the end credits. Essaying what the team went on to do; an alarming number seem to have gone into finance or real estate. I’m not sure what conclusion can be drawn from that.